May | 2011 | Can Men Cook? New seasons Lamb – sweetest from Devon? It still feels very strange even to a carnivore to go “aaaah” over a little frolicking lamb, then “mmmm” over a roast lamb dinner. I agree with Gordon Ramsey’s take, here. He has his kids watch what happens in the abattoir. Only on film, but you understand the sentiment. If you are going to eat it, you should know how it got there. Well, the lambs born in early winter in the soft parts of Devon are ready to eat. And what a treat. Chump chops from our butcher. Got the new potatoes on first – Cornish, so pretty local too, about 16 minutes, just served in their skins with lashings of unsalted butter. Lamb was shallow fried in olive oil, for 7 minutes first side, added some slices of field mushroom, then 5 minutes second side. Other veg? We had a 10 day old cabbage in the fridge. Pull off the leaves, cut out the centre rib from each leaf, throw about two away for decay and smelliness, and the rest was not only fine, it was grand! Black pepper, and butter on them. We had some green beans too – fine ones (probably french – darned air miles) and these were ready in 4 minutes (cabbage about 7). I now always put a big squeeze of lemon onto beans – and what a difference. It really brings something else out in the flavour. A robust Rioja had been breathing since breakfast, and it had breathed life well into itself. So there we are. We keep it simple when we are on holiday – I always think self catering is like posh camping, really. You just don’t have all the kit or familiar accompaniments with you – but there is nothing wrong with keeping it simple anyway. I have enjoyed reliving our holiday eating – hope you did too. Forget every other bit of food today. We are off as a foursome to Brampford Speke, North East of Exeter. Our visitors are on their way home, so we unecologicaly have to go in two cars. Harry the King Charles spaniel had a bit of a breathing problem when we were on the pre-prandial walk – it was mid 80’s – C dunked him under a running tap, and he seemed better. Quite scary with dogs though – they don’t want to let ‘their pack’ down, so stoically keep on moving. He’s OK now, dog lovers! So, we were slightly late in arriving. No problem. Always first names at The Toad. I’m going to tell you main courses first. They were fantastic. Women had Cornish Mackerel – fillets, pan-fried, with olive oil mash, gremolata and tapenade sauce. Now that sounds rich – but it was perfect lunchtime food. It felt light but strong on taste sensations. No chance of what I call ‘pizza boredom’. The last slice tastes the same as the first, but you had to endure another 5 slices to find that out. Do you know that feeling? Chris had Steak and Kidney Suet Crust Pudding. Then he drove home 180 miles. Frankly, I would have slept for hours! It included vegetables and roasties. Phew! I had A Salt Beef Stovie. I love hot salt beef. I remember having it once in a north London Jewish delicatessen. The owners and servers were an absolute delight – a real floor show of comedy. You didn’t want the queue to die down. Anyway, this was slightly different, with loads of vegetables. They do a deep-fried parsnip in Otter Ale batter. There have been fights over them, as some people try to sneak an extra one. It is unseemly. Wish I’d thought of it first. But I wish I’d had Pigs Head Three Ways. This just sounds so intriguing! What could it mean? Cheeks pan fied? Tongue? A whisker or two? I will order it one day, and you will be the first to know! Free range Chicken Liver Parfait, prunes and Armagnac confit with sour dough toast. Chicken Liver Pate was my dish on ITVs Britain’s Best Dish – so love to see what the competition is up to! It was sublime. Prunes and Armagnac – just changed the way it felt and was just a taste explosion of hard and tart and sweet. With and without – the parfait was completely different. Clever. And the piece of resistance? Potted Cornish crab with crab cappuccino. The crab itself was velvety, sea flavoured and fought over. The cappuccino? Orgasmic. No other word will suffice. A full on holiday day – full of food. Of then onto a tough and hilly walk around Chagford. When the guide-book says “This early part of the walk is unpleasantly steep”, you know it is going to be bad. We got lost first, trying to find the way onto the ridge, and had to stop many times on the way up. But yes, you have to say the whole point about that sort of climb is the view. Chagford is an inspiring sort of place. It is surrounded by 7 hills (all the best places seem to be – Rome, Cheltenham…), and whilst recovering, we had plenty of time to look back at them. In the distance we could see (with Binoculars) Michael Caines’s double Michelin starred place, Gidleigh Park. Ja nd I went there for our 25th Anniversary lunch, and had the full on Tasting Menu. Silver weddings don’t happen very often – so we did just go for it. It was fantastic experience. Some of the dishes had 25 or more ingredients that we could spot. I remember a poached quails egg – how do you get that right? Anyhow, that’s why they do their job, and I mine! We knew we were out in the evening , so snacky lunch in brilliant pub after visiting the famous Hardware store in Chagford. Webers and Sons have been there for years, just off the Market Square. I don’t now anyone who has visited Chagford and not visited Webers. And not bought something. It is an alladins cave of chandlers requisites. And you do lose people in the shop. My advice is to check watches and agree to meet outside in 30 minutes! Cleave – we have been here earlier in the holiday – but now for a full on evening meal. Rabbit stew (local), Lamb Tagine, Jerk Chicken and Steak Casserole (in Otter beer). You can see the variety on offer here – quite splendid. The new owners have gone for a brasserie feel. This does mean you can fill your face heartily, or be a bit more small and tasty as the mood and hunger pangs take you. My rabbit was really deeply, strongly flavoured. I liked the addition of shallots rather than onion – the sweetness enhances the sweetness of the rabbit, I think. Just simple and tasty – with a bit of tarragon to help. Jerk chicken was on skewers and grilled – which worked well, but I am used to it being more stew like. Rice and beans – excellent with it (and traditional?) Lamb – pleasingly fruity, and beef casserole – melt in mouth like it should be. We didn’t need a lot of rocking to get off to sleep. Light lunch – bacon (very thin cut on a real bacon slicer by our real butcher, Steve). The bacon is what I would describe as Ulster cut – they seem to love it very thinly cut in Northern Ireland. Maybe they ike it crispy, or like to make the bacon go further? It also is very cheap to cook, taking about 3 minutes! Jane does the scrambled egg – I always forget about it and overcook it. J serves it as it still looks runny, and it does cook still after serving. Brown off the meat first. I use a large frying pan over a medium heat. It is easiest to break it down while it is frying with the back of a wooden spoon. Chop up the bacon into very small pieces – size of your little finger nail. Add that to meat. Chop the onion (after peeling it, you fool! ), move the meat over to one half of the pan, and fry the onions in the other half. After about 5 minutes, the meat should be browning (keep breaking it up with the spoon). Now mix it all together (the onions should be softened and glistening), and add in the mushrooms. Fry another 5 minutes, then add the tomatoes, crushed clove of garlic herbs, and seasoning. Cover. Simmer (lowest heat) for 10 minutes or however long it takes to boil the pasta and prepare the mixed salad. There’s not even a lot of time to get a Gin and Tonic in during this full on fast meal. It used to be our favourite Friday night dinner, with a bottle of claret. We still do that quite a lot – it just feels very Friday to me. But this was w Wednesday, and the second bottle of red went down well too. There’s an organisation we belong to called The Otter Valley Association. (OVA). We first heard about it while visiting Otterton Mill. They have a booklet of 12 walks in and around the beautiful Otterton Valley. Very varied walks – River, Country lane, and coastal. 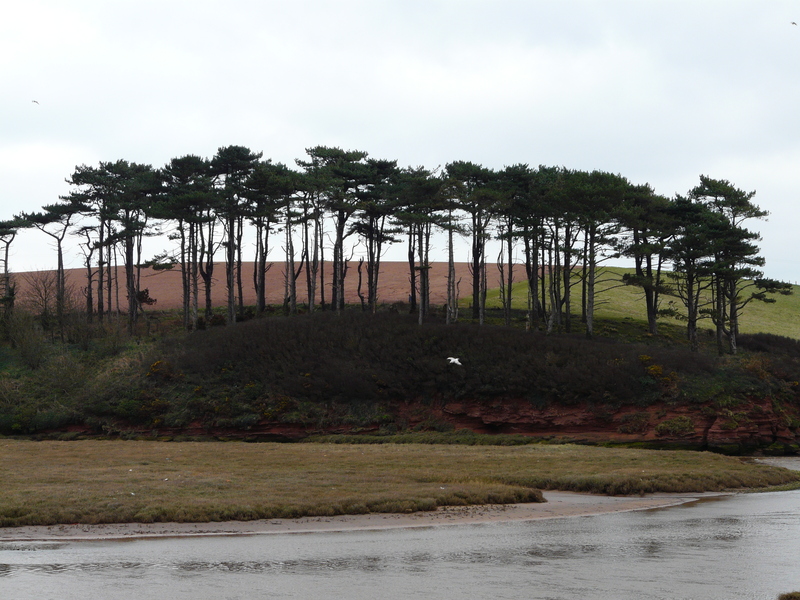 Some (Ladram Bay from Budleigh Salterton, via an excursion along the Otter river), are both strenuous and magical. We had decided on a simple to and from walk, starting in Budleigh Salterton. This is an iconic view of the River Otter as it enters the sea at Budleigh Salterton. We find it rather calming – no idea why! It’s a two or three-mile trail up the river to Otterton itself – which did used to be the port in 15th C. Times and coast do change. The food cafe at Otterton Mill is a big draw – maybe even more so than the Craft Centre, and Mill itself. Having said that, they do sell their own flour that is still milled here, and if you don’t want it in rudimentary form, bread and pastries made with the flour are available to the hard of cooking. Light lunch? Bottled Otter Ale (Head Brewers Choice) – seems churlish not to have the splendid beer when we have walked the Otter, and were sitting in Otterton Mill! For the second time in a week I had Moule Mariniere. I find mussels almost impossible to resist. OK – everyday may be more difficult…but they are always a bit different. Here – more of a modern twist – a slightly spicy feel, with the middle eastern / mexican spice Cumin added. J had Brown Crab meat on a crouton. Although we both felt we knew this would be on the strong-tasting side – the brown meat is very crabby! – it was actually a little too strong for our poor little buds. We were warned though – so that is our choices fault, not the chef’s. For what is a self-service ordering cafe, the whole food experience is quite cheffy. They do cookery courses, milling experineces and wine tastings here – led by the food people – so It’s not really a surprise. Monday – Went for a really rather beautiful walk to and from Start Bay to Dartmouth Castle. The Dart is perhaps one of the most beautiful rivers in Britain. Managed a tea shop half way round – just liquid, because we wanted to leave space for the treat to come. That treat is The Start Bay Inn (Between Dartmouth and Salcombe in The Hams part of Devon). We’ve been here many times. The previous owner retired and handed onto the next generation of his family. He still goes out fishing early every day, so the fish is indeed fresh. It is indeed a special place. 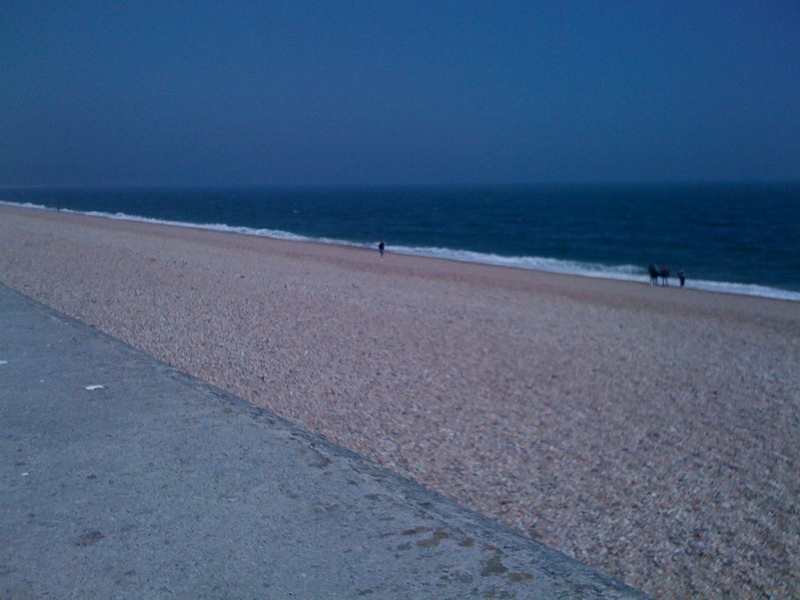 Start Bay is very strange – like Chesil Beach in Dorset, if you know it. 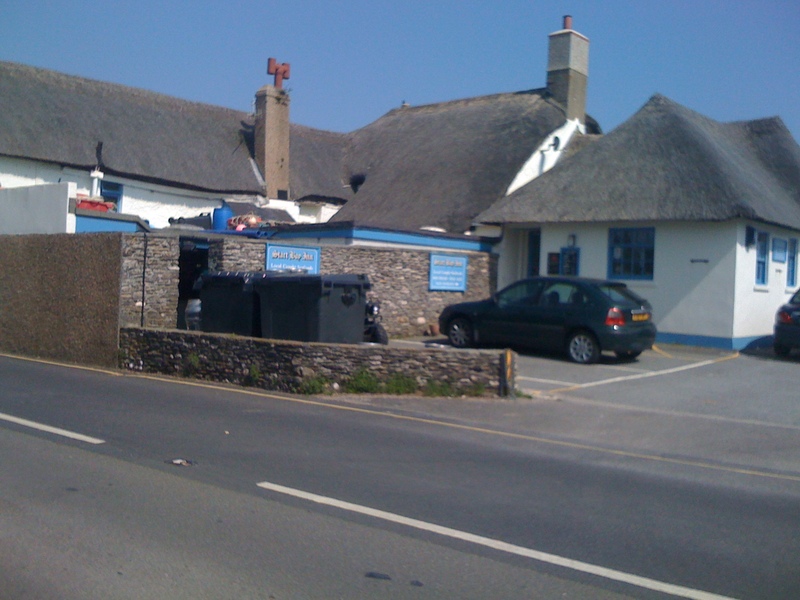 On the front side of the pub is the sea. Come out of the rear entrance and you find a huge freshwater lake. If the winter storms breach the sea defences – fresh water Site of Special Scientific Interest suddenly becomes dead. When we went to the butchers next day they did ask where we had been to. I couldn’t remember the pubs name. “It’s that Fish and Chips place on Start Bay”. David replied “You mean The Start Bay Inn”. Felt a bit stupid. Who needs a branding department when you’ve got simple marketing like that? Anyhow – they do medium or jumbo levels of favourite fish – cod, haddock, hake, then skate wings and anything else that is seasonal and recently caught. Just with hot fresh chips and a bit of garnish. More fat than I’m used to nowadays, but a holiday treat. They serve English white wine from Devon here too (Sharpham, from Totnes) – and it goes surprisingly well with the deep-fried and beer battered fish. Needed a post prandial walk to get rid of the excesses. There were many wildfowl to chat to on the freshwater lake. if any of them reply, I shall begin to worry. Sunday lunch – a great institution? This is now officially the busiest time in food driven pubs. Sunday Lunch makes other quiet days liveable with, what with the Great British Pub Trade being under immense pressure (beer taxes in pubs have risen by 77% since January 1997). This is not a pub friendly government! With the VAT increase too, your pint now has more than £1 of tax mixed in with the hops and barley! So food is the lifeblood of profit, and Sunday the key day to get the crowds in. This does make it difficult to get anything other than a roast dinner or carvery in your standard pub. We wanted a snack and a walk. So, 3 miles to the pub at Lustleigh (The Cleave), snack, then 3 miles back. Look, in a perfect world, I would like to have my pit stop on a walk at 2/3rd the way around a circular walk. This is of course impossible if you are on a ‘there and back’ walk. Obviously, it’s about half way! It’s a nice, flattish walk from Bovey Tracey, following The River Bovey through woods and some open fields. Virtually every other walker has at least one dog with them, so much of the time was spent stopping and discussing the dog with the owners. The Cleave with its latest landlords has adopted a brasserie style of food offerings. The small plate concept was in evidence here too. We had homemade hummous and Garlic Prawns on skewers. Chefs have a lot of input here – the side salad / garnishes were different for each of the plates, as was the dressing. splendid tasty bread too. Remember the ham we started two days ago? It’s final appearance was tonight. We had some spuds left over, so I chopped and fried them, with spring onion and tomatoes, with a few mushrooms chucked in too. Ham was cold, with Parsley sauce out of the packet one more time! I really like using leftovers. Billions of pounds worth of food are thrown out in the UK every year.I am making a minor contribution to reducing this mountain – and you can too.